For aficionados of vinyl recordings, the challenge has always been to glean from each recording every nuance buried within the grooves. This not only includes the obvious audio detail, but also the warmth and realism they are noted to possess. Incorporating the GroveMaster Turntable in your audio system should be the starting point. The next step is to employ our dedicated phono pre-amplifier and power supply. Together this unique suite of components will shape and hone the faint signal emitted by your pickup into a fully-blossomed current filled with all the delicious bluster and tonal nuances you expect. Working in unison with your cartridge, the Olympia-Pi or PXi will convert the delicate low-output signals into the natural sounding acoustics that lay hidden within your recording. Some would consider both of these pre-amplifiers overbuilt. 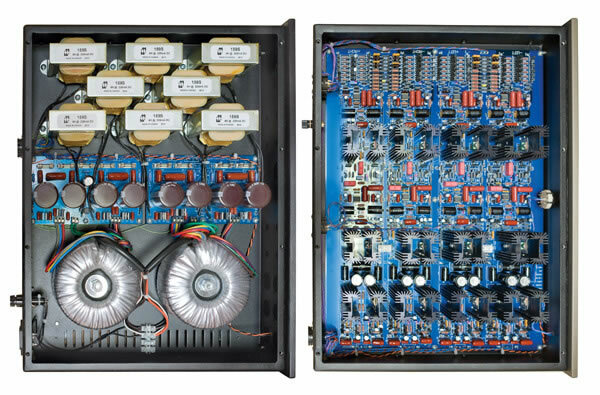 Their power supplies alone are larger than those of most amplifiers. These amps allow you to optimize the low noise, accuracy and high gain required for achieving the absolute best dynamic range. The Olympia-Pi and PXi were designed because they are the right components for the job. PBN is always about doing it right, every step of the way. If you are incorporating vinyl recordings into your audio pleasure, then do it right. Use the GrooveMaster and the components that will enrich the signal. We make them all … and we make them right!